Pull one of the two durable chairs up to the child-size table—they’re sturdy and sized just right for kids! This hardwood table-and-chairs set has a timeless natural finish that fits any home decor, and it easily wipes clean to stay looking sharp. The 3 wooden pieces are simple to put together with just a Phillips-head screwdriver, and they’re incredibly sturdy once assembled. Top the table with your child’s favorite puzzles or use it for arts and crafts, tea parties, lunch and snacks, and so much more! The 2 chairs stand 24.75 inches high with an 11-inch seat height, and they have a reinforced, tip-resistant design. Melissa & Doug focus on making high-quality furniture sets for kids. 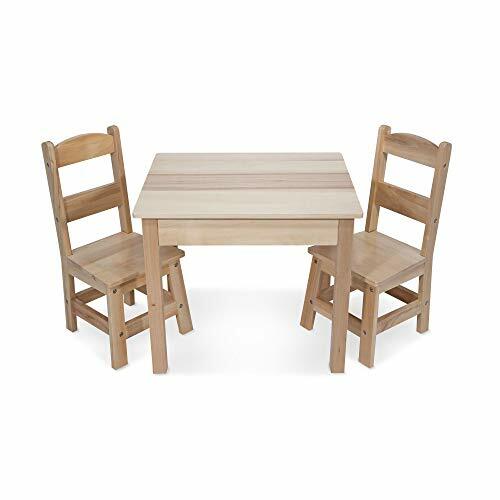 We have built this sturdy wooden table-and-chairs set from durable wood, with materials that are designed for frequent use. The Solid Wood Table and Chairs set makes a great gift for kids ages 3 years and up. When assembled, this 3-piece table set measures 20” H x 23.5” W x 20.5” L and weighs 25.8 pounds.